3XS 42.5" 17.7" 25.2" 24"
2XS 43.3" 18.1" 26" 24.8"
XS 44.9" 18.9" 26.8" 25.2"
S 46.5" 19.3" 27.6" 26"
M 48" 20.1" 28.3" 26.4"
L 49.6" 20.9" 29.1" 26.8"
XL 51.2" 21.7" 29.9" 27.2"
2XL 52.8" 22" 30.7" 27.6"
3XL 54.3" 22.8" 31.5" 28"
4XL 55.9" 23.6" 32.3" 28.3"
5XL 57.5" 24.4" 33.1" 28.7"
A. CHEST: Measure around the broadest part of the chest or bust. B. SHOULDER: Find the point on your shoulder directly above your arm pit. Measure straight across from that point to the same point on the opposite shoulder. C. LENGTH (CENTER BACK LENGTH): Measure from base of neck to hem length. D. SLEEVE (CENTER BACK SLEEVE LENGTH): Measure from the base of the neck, center back to shoulder, down arm to wrist with the arm bent. 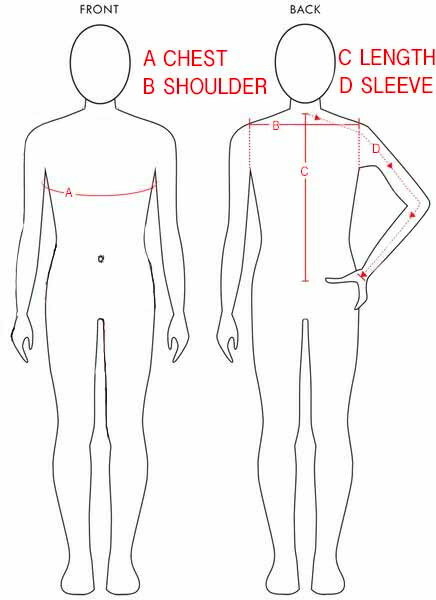 NB: We are recommended that if you don't know your sizes of the chest, shoulder, length (CBL) and sleeve (CBSL) in that case you can follow the "Size Chart (Weight vs Height)".